Beau Jest Moving Theater and the Charlestown Working Theater proudly present three excessively outrageous one-act plays by Tennessee Williams in Wild Williams. If your only experience of Tennessee Williams' writing is The Glass Menagerie, fasten your seatbelts. Two world premiere productions Beau Jest performed at Provincetown's Tennessee Williams Festival and a third play never seen in Boston are presented together in this revue of the playwright's zany late work. The Pronoun I is the fairy tale of Mad Queen May and a poet's obsession with self. 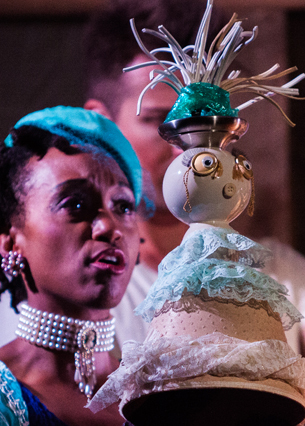 The Remarkable Rooming House of Madame Le Monde is a dark tale with a sinister sense of humor written to provoke as part of an evening of Grand Guignol. Aimez-Vous Ionesco? is a gentle lagniappe, as two old friends reminisce about their youth and a chance to sweep around the ballroom one more time with the Nijinsky-inspired Mr. Coppitt. For mature audiences only. Very adult themes and language.